The installation of Green-Pipe products on the WGF Alliance project reduces the need and use of environmentally sensitive raw virgin materials. A total of approximately 67,196 2L plastic bottles were saved from landfill to make the 157m of Green-Pipe installed along the WGF Alliance project. 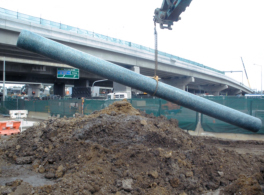 Locations of Green-pipe along the West Gate Freeway Project include; between the Bolte Bridge and Todd Road where a total of 43.5m of Green-Pipe was installed, 90m of Green-pipe was installed at the Montague Street Intersection, 23.5m of Green-Pipe was installed between the Bolte Bridge and Montague Street..
Green-Pipe product lengths were manoeuvred easily by two people during construction. Ease of handling, solved many difficult access issues and at the same time reduced machinery requirements. Installation led to reduced plant costs across the project whilst the lifecycle cost was lower than comparable products for most applications. Green-Pipe has been successfully tested in accordance with AS1462 & AS2566 for (crush) strength and life underground. 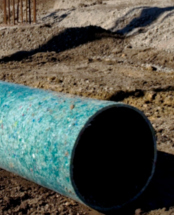 The product has now been approved by VicRoads for use on VicRoads projects so the future opportunities of Green-Pipe could potentially see 100% use on future road projects which would no longer see the need for concrete and non-recycled plastic pipe installations.